A Giromill is a Darrieus type vertical axis wind turbine (VAWT) generator. Unlike the more commonSavonius VAWT, the Giromill wind turbine uses lift forces generated by vertical aerofoils to convert wind energy into rotational mechanical energy. The giromill was included in Darrieus’s 1927 patent for vertical aerofoil powered vertical axis wind turbines, however development is now starting again on new giromills which take advantage of modern ultra strong light materials to produce turbine blades robust enough to cope with the stresses they are put under. 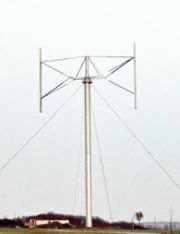 The giromill is typically powered by two or three vertical aerofoils attached to a central mast by horizontal supports. While it is cheaper and easier to build than a standard Darrieus turbine, it is not as efficient, and requires strong winds (or a motor) to get it to start rotating. They can also sometimes struggle to maintain a steady rate of rotation. However, giromills can work well in turbulent windconditions and are an affordable option where a standard horizontal axis windmill type turbine would be unsuitable. Below is a video showing a cardboard scale model of a giromill design being tested with a domestic fan in place of the wind. This video demonstrates how even though the fan is blowing strongly, the giromill is not self-starting – it needs a little push to start it rotating. Once it gets going however, it keeps going well as long as the fan continues to run. A useful variant of the Giromill is the Cycloturbine (pictured below) which uses a vane to mechanically orient the pitch of the blades for maximum efficiency. This gives the cycloturbine the advantage over other Darrieus wind turbines of self-starting. In low winds the blades are pitched flat against the wind generating drag forces and starting the turbine turning. 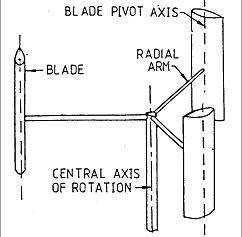 As the rotational speed increases the blades are pitched so that the wind flows across the aerofoils generating lift forces and accelerating the turbine. This mixture of drag and lift (Savonius and Darrieus) makes for an efficient VAWT design, but it is of course more complex, heavy, and expensive to build.